Flow is a lot more interesting than batch. This occured to me in recent conversations with one of our team leaders who schedules work for her area. A series of well-intended but misdirected steps had created a batch process in her area. She couldn't figure out how to fix it but we managed to reverse the errors well enough and regain flow. Two weeks later, she couldn't be more pleased. "We are getting more done each day," she beamed. Why? I asked. "Well, there is more variety. We work on several different products each day and that stops boredom. Plus, by doing that we use different materials and are less likely to run out of our supplies." There is all the theory of why flow trumps batch, why synchronizing production to sales works, why pull is better than push, why reacting promptly is better than predicting accurately. Yet, when you get down to the core, it's also just a lot more interesting. "You know, farming looks mighty easy when your plow is a pencil and you're a thousand miles from the corn field." Ike had it right. Need we say more about getting out of the office and to the place where we add value? About showing respect for the folks doing the work by spending time in their worlds? About feeling the rocks in the soil and the insects crawling and the joy of a good harvest and the sweat by which it comes about? No wonder the Allied Armies were willing to follow and fight for General Eisenhower. My thanks to Jamie Flinchbaugh for pointing me to the Eisenhower quote. As long as I've worked at implementing a Lean strategy, I continue to find it amazing how a description of it seems to fall flat on others' ears. A common reaction is "Well, it's just common sense." Which is truly a comment which dismisses it as a viable strategy. Lean works when folks accept the fact that "simple" works. That replacing what you sold is an effective inventory strategy. That a promptly-recorded, hand-written metric is an effective visual indicator. That a manager walking down the hall to see a situation for herself beats the daylights out of a screen-full of four decimal pointed figures. Our access to technology and obsession with sophistication blinds us to simple processes. Simple processes are, less and less, "common sense". And it is that simplicity which is truly Lean. Flying well under any publicity banner, today marks ten years of this blog. My first-ever post, on September 14, 2002, got this whole thing going. 568 posts later, allow me a few reflections. Ten years ago, there were not many resources about Lean on the web. Blogging itself was new; the concept of self-publishing triggered consternation for many, worried that unedited text would lead the world astray. My rationale for starting this odd exercise was simple. I was learning more about Lean. Many of the vendors with whom I worked wanted to learn as well...we linked up electronically. Amazingly, others enjoyed it as well...people I never knew, around the world. I kept writing. The exercise helped me learn. And a lot has changed. Lean resources have multiplied on the web. There is terrific stuff out there in many forms...solid material by outstanding thinkers and writers. Blogging, as a medium, grew greatly and then faded as Facebook, Twitter and mobile apps unchained people from desktop and laptops machines. Attention spans also shortened. Even the best blogs use fewer words now than five years ago. Nevertheless, I continue to learn much about Lean...I'm almost 14 years into applying this framework for approaching processes. And I feel I'm going deeper into it. How do we implement it? How do I explain it? How do I bring others along, philosophically? It's easy to explain a kanban system. But how to bring others along to grasp the criticality of a pull system? That's a different level of conversation. That's what I'm learning. I less sure just how to write about it; thus not so many posts here in recent months. But, man, am I still learning. And the blogging platform uniquely allows a "parking place" on the web for substantive thinking. So, I'll keep this alive. After all, it would be a shame to not try to go for twenty years. Keep learning. And thanks for reading. One of our supervisors recently began a very useful practice, its clear elegance being a model worth considering. She was faced with a physical constraint in her area, in her case a particular piece of equipment which seemed to limit her group's daily production. But to what extent did it actually limit production? She launched a very simple experiment. Each day, she asked her team if they could produce one unit more than the day before. While the group (and the supervisor) thought the limit was 254 units, they tried 255. It worked. The next day, they tried 256. Hmmm. She then asked what they learned with one more unit. The group made observations. And tried 257. The process has continued over the past month. And they have discovered they do have a constraint but the limit is both higher than they imagined and also more manageable they they had thought. Goldratt says the second step of dealing with a constraint is to maximize it. This is just what she did. Just as a skilled physician gently probes around the perimeter of an abdominal mass to understand just what it is, this team gently probed the extent of the constraint and, in so doing, understood it in a remarkably new way. Please note, this only works with a system bumping into a constraint. If the customer is not asking for one more item, you only create waste by making one more item. But, to understand a limiting factor, this is a very quick, simple and low-cost method to learn much. While not a Lean expert, ESPN commentator Colin Cowherd recently made a comment I found insightful. Observing three organizations which seemed to be consistently successful, he found this common theme amongst the San Antonio Spurs, the New England Patriots and the Boise State football program. All three teams consistently outperform any expectations made on the basis of the "talent" they have. All three have had long-tenured leadership which has maintained a consistent perspective on how to succeed. None are flashy. All repeatedly win. One of shortest, best descriptions of the philosophy of Plan-Do-Check-Act I've seen in some time is here, published a few days ago by Seth Godin. Mull on it. To your own benefit. Why do we have the Hot Dog bun? Because a guy instinctively wanted to stop waste and improve his business. ...the best story comes out of St. Louis in the 1880s, and there was a street vendor who was selling [hot dogs]. At the time they weren't called hot dogs, they were called either red hots or frankfurters. And while selling them, he would give out white gloves, because when someone would buy the red hot they wouldn't want to get their hands scalded or wouldn't want to get too greasy. The problem was that a lot of the patrons were running off with the gloves, and this was really hurting his bottom line. What he ended up doing was going to a brother-in-law of his and saying, look I have this problem, and he was lucky enough that his brother-in-law was a baker and suggested the soft roll. The white gloves constituted over-processing waste, doing too much to the product. Yet, he also had to keep the grease off the customer's clothes to prevent a waste of defects. Thus, he integrated the protection with the product. Explain this to your buddy next time you visit the ball park. Or better, bring along some white gloves to make your point! 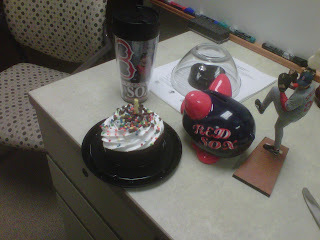 On my way to work recently, I stopped by the bakery of our local grocery store to buy a celebratory-looking cupcake. While making my choice, I spotted this sign on the counter. Plan to Actual. With a twist...it was out there for all the customers to see. And I was surprised. Why was the target so low? And why was neither the store nor the bakery department hitting the goal? And how did they get these numbers in the first place? This is a well-run store and the bakery department in particular is very good...I've ordered any number of specialty cakes over the years and they always do a terrific job. "So how can I improve your score?" I asked. The manager smiled, thanked me for noticing and told me I could find a link on the bottom of my receipt where I could give voice to my satisfaction. And I figured out why the score was so low. The survey was long, at least 5 screens worth. I skipped a couple of questions and got an error message demanding me to go back and answer all the questions. Only deep into the survey did they ask about the actual bakery. Bummer. All that work and it didn't even take. I was a very satisfied customer. And I couldn't make a clear, simple statement to the store of that fact. 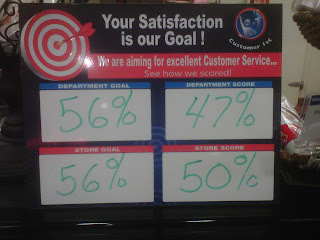 And how did the store take 5 screens of data and boil it down to a single metric? Did anyone know? Did the bakery staff know? Why was the bakery's score "47%"? Percent of what?? I was willing and anxious to help bump up that score but was unable. It's a good thing, a very good thing, to have visual, transparent tools. It's a horrible thing, a very horrible thing, to have the method of making those measurements disconnected from the display. Could my customers figure out a way to bump our score? Can my employees figure out how to help our visually-communicated metrics? PS. What was the celebration about? The three of us die-hard baseball fans at our shop had a small ceremony to sing Happy Birthday on the 100th anniversary of baseball in Boston's venerable Fenway Park. Yeah, we really sang. Yaz would be proud. I've long been a fan of Tom Peters. Second only to Peter Drucker in business writers who have influenced me, Peters' often brash views have jarred and stretched me repeatedly ever since I read "In Search of Excellence" for the first time in 1982. I'm also a fan of systems...thus this blog about Lean. So, when Peters published a short paper on the role of systems last week, I read it with interest. While systems have a place, he says, it is SECOND place. In that setting, systems work. Apart from these prerequisites, systems are inadequate. The paper is worth your reading. It squares with my experience. Look each person in the eye and greet them by name. Observe the visual management tools in the area. Note what is normal and what is not normal. Have one conversation of at least three minutes with one associate. Explain "why" to one person. Have a hearty laugh with someone. The more I use them, the more I'm amazed at Control Charts. These simple, visual tools have been around for a long time. And, I've observed, those with keen numeric skills have made them more and more complex. Yet the simple is good. And handwritten is even better for communicating the state of a process to those involved in that process. Think about it. It is a simple graph. Time is plotted along the bottom. It can be hours/shifts/days/months. It doesn't matter what but the period needs to be appropriate for the data. Then, each period, a person places a dot to measure the parameter in that period. The 3 horizontal lines are a mean or target level for the paramater and upper and lower control limits (UCL and LCL). Typically, these lines are placed 2 standard deviations above and below the mean. This recognizes that there is inherent varability in a process. If the varability stays within bounds, the process is working. If a point exceeds the bounds or shows a trend within the bounds, there is un-natural variablility. In the first case, we say the variation comes from common causes. In the second, we call is special cause. To mess with common causes is called "Tampering". To ignore special causes is called "Neglect". Don't tamper. Don't neglect. Yet, the beauty of the control chart is not the dots or the lines or the statistics. It is in the conversation the chart data provokes. The chart focuses attention on the right thing...is the process stable? If not, what causes the instability and how do we fix it so it stays stable, longer? It allows the group to avoid finger pointing and talk about issues that matter. It happened again for me this morning. It never gets old. If you are not using this simple tool, try it. One of my jobs is final checkoff on all our invoices before payment. And I've noticed a trend over the last year. More companies are adding small fees to the bottom of invoices called "Environmental Fees". These fees tack on $5 to $20 to each bill. I'd expect that from chemical companies getting rid of some waste products. Perhaps from others with difficult disposals. Yet that's often not the case. On fully 3/4 of these invoices the companies offer no clear explanation why this fee is appropriate. Are these fees valid? Or are they just surcharges, adding no value, disguised in a manner to which our green-oriented society cannot object? Much of it feels like a different type of waste. Which lowers value. Try this next time you try to explain flow. A system with single piece flow is like a domino chain. One stimulus brings about predictable results. And this applies to physical flow as well as information flow. The vendor had hardly sat down when the deluge began. We had asked his company for a proposal on a modestly-priced piece of equipment. When we met, however, it was as if he felt he had to blurt his entire proposal in 90 seconds or it would somehow evaporate. But it wasn't 90 seconds...it continued, unabated, for 10 full minutes. My head hurt. I wondered what I could do to gain some clarity. "Can I draw a picture of what I think you are saying?" I finally asked, pretty much interrupting the spiel. He wasn't quite sure what to say. I flipped a page over and sketched a bell curve based on data he presented. I slowed my pattern of speech and asked some short, specific, yes/no questions. We finally got clarity. The simple drawing altered the communication pattern. It stopped the talking. The drawing helped sort reality from hype. It slowed the mind well enough to ask good questions of the essential facts. Our eyes are keen sensors. Fast talking only uses the ears. Better to use both. We just passed through the end of a calendar month. That brought several reviews of metrics with colleagues. Which reminded me...it is easy to remember the short term Plan-Do-Check-Act. The kind that happens in a day or two. We try something, quickly, then see if it works. Yet PDCA happens in concentric circles, widened by longer time intervals. Did our bigger plans work last month? Last quarter? Last year? Over the past five years? The longer time frames require us to write something down, then pull it out to review. It's a stronger discipline. So here's an exercise for you and your team to liven up your next process-excellence gathering. The story below comes from a colleague of mine, who gave me permission to use it as written. On the one hand, we could read it and go "tsk, tsk, why don't medical facilities improve?" That does us no good, however. Try this instead. Distribute this story to your team. Then ask one person or sub-team to take the role of the physician, another one the role of the office administrator, another the role of the patient, another the unseen director of the clinic. Then make some proposals; how would you improve this? How would you communicate it? What principles would you employ? How would you measure it? Who would you involve in the discussion? How would change happen in this setting? By looking at others we learn about ourselves. Went to the dr's this week for a simple dermatologic procedure. My appointment was set at 11 and I was told to expect to be there for an hour. I presumed the procedure would take about 30 minutes, and maybe prep work and post work would be the remainder. Not so. I arrived and was promptly taken to the procedure room by my nurse. She said the procedure indeed would take 15 to 30 minutes, but I should sit tight so she could find the dr so I could meet him. Odd, I thought, I figured we could break the ice before or after my procedure. She asked that I try not to be intimidated when I meet him, because he was "a real doctor, busy busy busy, lots of patients to see". And then came the real kicker, she listed the questions he would ask me and indicated I should "think about the answers because he needs to move on to his next appointment quickly". She left and returned 20 minutes later, indicating that he had another procedure scheduled at 11 and it would be an hour and a half before he could meet me. I started towards the door and told her I would need to reschedule, I couldn't wait that long. She asked that I stay; she said that she was going to be doing my procedure anyways so we could get started immediately. - Why was the appointment made longer than procedure required? -Why did the nurse have to "hunt down" the doctor for a quick meet and greet? -Why not stagger appointment times if this is really important? -Why did she feel compelled to warn me of his busy nature? -Why didn't she just finish my procedure first and give me the option to meet him afterwards? - I felt like a "part", something that needed processed and moved on, not a person that had questions or concerns with a medical procedure. - Do I make people feel this way? - Do I respect the time of others, or make them wait on my own busy, busy, busy schedule? For me, a fundamental of Lean is in gaining efficiency and respecting people. This doctor had attempted to gain efficiency, but perhaps inadvertently not respected the time of others. The National Basketball Association really doesn't interest me, I much more enjoy college hoops. Yet, the story today of the sudden resignation of the coach of the New York Knicks NBA team caught my eye. The coach was caught in a bind. The owner of the team meddled, selling and trading players with an eye to individual stars. The former coach, in contrast, had a cohesive style of play which he was attempting to implement. He needed players with the physical and mental skills to carry out that style of play. When the Knick's highest paid superstar objected to this style, ostensibly because it deemphasized his own ability to show his individual skills, the atmosphere was simply too tough for the coach. And he said "enough". Having a common view of what success looks like and agreement on the core strategy to achieve it is essential. Point speed vs system speed. Do we agree?? Paying attention to that commonality is part of the role of a Lean leader. So a lot of themes are going to come back on the next record, I think, and they’ll always be there. On the one hand, maybe that might seem unoriginal, to keep recycling over and over again, but I also think novelty is overrated, and I think coherence is undervalued. Coherence trumps novelty. Even for a "creative" profession. This band, anyway, wanted to have a recognizable theme, over time. Some consistency. A shape, a direction, something that hangs together, over time. This is the same challenge for us as Lean leaders. The principles really don't change. Yet so many forces want the "new" thing...the new trick which will somehow make process excellence easier. The newness breeds the "flavor of the month" cynicism which tears apart excellence, however. It's up to us to fight that trend, keep bringing the same theme back, over and over, yet in a fresh way, just like the band is trying to do. Also useful in raising children. Late last year we ordered a sizable (for us) piece of capital equipment. Promised delivery date, from the start, was March 1. Updates through January and most of February confimred the March 1 date. They are a bit behind…now on track to ship the week of March 12th. With a week to go, the schedule slid by two weeks. Managing projects is the stock-in-trade for most engineers and technical leaders. And projects have common problems. While some truly surprise, most we can anticipate. Yet, repeatedly, I mess up project management. And I know I'm not alone. It's a subject by itself. Tools play a role. Clarity of thinking is more crucial. Jamie Flinchbaugh has done the Lean community yet another favor. He recently released an ebook, A3 Problem Solving. I've read it, twice, and found it very useful. Of particular interest is his focus on clarity of thought as opposed to simply mechanically filling in pre-formed boxes. Why do we use A3s?? It is to gain clarity on the nature of the problem, the complex problem; clarity on the root cause of that problem; clarity on what we will do about the problem; and clarity of evaluation on the effect we had on the problem. In short, the purpose of A3s is to shape our thinking by shaping our doing. This is not a free ebook. But neither is there a set price. Jamie allows YOU to set the price, based on what you think the value is to you!! Very cool...walking the talk. Met with a guy today who loves manufacturing and he threw out a wonderfully simple assessment of when to try to automate a process. "Automate when it's dull, dirty or dangerous." You could find way worse rationale. Some concluding thoughts, with personal illustrations about "things we notice", thanks to pal, Hal Macomber and his citation of Fernando Flores. Flores explained this more effectively with the distinction "disclosive space." In short, what we see is governed by three concurrent aspects of our being. We see what we can distinguish, hence the need to learn. We see what we are concerned for, hence the importance to be clear for oneself and in social groups what concerns/goals we pursue. And, we see in the midst of our everyday doing...the habitual way we engage in the world, hence we need to be deliberate to the point of choosing our habits to give us the opportunity to see. Regarding #1. I drive down the street with my wife. I see trees. She sees maples, oaks, ash trees. She sees healthy trees, sick trees, ash trees at risk for the emerald ash bore, trees which will live for 30 years, trees which will tear up a sidewalk, trees which will best enhance our city. She's on our town's Tree Commission and knows her stuff. I drive down the street with my wife. She sees a jogger. I see a young runner training for cross country. I see a middle age lady who is a new runner. I see someone nursing a sore left Achilles tendon. I enjoy running. She finds it an interesting hobby for others. We see what we can distinguish. My wife can distinguish trees. I can distinguish runners. Both are learned skills. But without learning, we can't distinguish. Regarding #2. My youngest son is a US Army Officer. He just informed us his unit will be deploying later this year for a 12 month tour at Bagram Airfield in Afghanistan. We now listen to the news with new interest, our ears perking at mention of this airbase. Our concern is for our son, thus we notice much more than we used to. Regarding #3. Two years ago, at a Lean Enterprise annual conference, I heard the clearest description of standard management work I had ever heard. Two weeks later, my chief co-worker and I began a disciplined daily walk-around of our operation. We've only missed 3 work days in two years now. We created a habit of going to see, in the work place, every day, in a way that was transparent and focused on things that matter. We've chosen to form a habit of walking to gemba. Looking for key parameters. And often noticing other things we would not have seen otherwise. I hope this series has been helpful. Please reflect a bit on it and find one thing you might change as a result. As Ohno says in The Birth of Lean: "If you're going to do kaizen continuously, you've got to assume that things are a mess." Brilliant. If everything is OK, I have no need to improve. Why is this hard for us to do?? Is it our culture of self-esteem, holding "feeling good about ourselves" as a supreme value? Do we simply compare ourselves to ourselves, so we always look OK? Are we all from Lake Wobegon, the ficticious Minnesota town where all of the children are above average? A view of a zero-waste state will shake us out of this arrogant stupor. With that perspective, things are indeed a mess. We've talked in recent days about how our commitments, concerns and habits affect what we notice. And what we notice drives our behavior. But what does this look like in business?? A recent Wall Street Journal article described this well. Ever wonder what happens when you walk into a restaurant? Many are trying to get a step up: "How Waiters Read Your Table"
Reading a table happens within seconds of a waiter coming to a table. By asking for a cocktail menu or smiling and making strong eye contact, "they are saying 'hey, I want to engage with you and I want you to make me feel really important,' " says Mark Maynard-Parisi, managing partner of Blue Smoke, a pair of barbecue restaurants in New York, owned by Union Square Hospitality Group. If people seem shy, "you want to put them at ease, say, 'take your time, look at the menu.' "
And, with practice and habit, the server learns to make these assessments in seconds. But it all starts with a commitment to notice. The third point about noticing goes deep to our involuntary actions. I notice things I'm used to noticing. It is my habit. Do I notice what people say about me? Or do I notice other people? Do I notice what the company is doing for me? Or do I notice how I can contribute? Do I notice what I notice? Or do I just kinda keep going on? Hal uses, intentionally, the word "deliberate" regarding the choice of our habits. Well said, pal. Continuing on "things we notice" following conversation with old friend, Hal Macomber regarding the work of Fernando Flores on this topic. 1.We see what we can distinguish, hence the need to learn. 2. We see what we are concerned for, hence the importance to be clear for oneself and in social groups what concerns/goals we pursue. A friend took a new job in a company solely focused on market share. His experience was all in a profit-oriented company. "Why don't they care about profits?" he whined to me. See point #2...management is concerned for market share. Paul O'Neill took over as CEO of Alcoa in 1987, he was centrally concerned about worker safety. Surprise...he noticed safety and matters which affected safety. The public school teacher is concerned for her job. She thus notices affronts to her union, which she views as the protector for her job. We each have concerns, that's not the question. The question is whether our concerns align with wise behavior, with worthy professional goals, with productive interpersonal habits. And achieving this alignment demands some reflection, to understand, deeply, our real concerns. And to adjust (or blow up) some of them if need be. Continuing to review recent communication on "things we notice" with my friend, Hal Macomber, on the work of Fernando Flores on this topic. 1. We see what we can distinguish, hence the need to learn. At one extreme, consider what happens if you travel in a foreign country. You don't understand the language and are, effectively, unable to either hear or speak. You are forced to notice primarily through your eyes, since your ears are unable to distinguish the new language and your tongue does not wrap around the new words. Yet, even your eyes are less reliable since you are new to the culture. How to notice better? This one is obvious; learn the culture, learn the language. We are in deeper challenge to notice better in our own worlds, however, because we already know a lot. But have we learned enough? Do I know enough about my processes to notice if something is amiss? Do I know enough about my market to notice if a regular customer is no longer ordering? Do I know enough about my project to recognize if a step is out of sequence? Do I know enough about people working with me to notice if their mood is altered? And how do I learn if I am not curious? The root of learning rests in curiosity. Inquisitiveness. Marveling. Interestedness. It's the opposite of passivity. Indolence. Apathy. Try this today, this weekend: be curious about something with which you are already familiar. Perhaps it is your daughter's new phone. Perhaps it is a single process step you used to actually do. Perhaps it is the new bush your neighbor just planted. Learn something new. And then reflect if you noticed at a deeper level. Continuing to review recent communication on "things we notice" with my friend, Hal Macomber. Hal cites the crucial work of Fernando Flores on this topic. If you are not familiar with Flores' work on the criticality of language, here is a good summary article. I'll let you absorb this for a bit and discuss each of these three distinctions by themselves. It's a bit like eating fudge...very tasty but you can't really enjoy it in big bites. Further thoughts on what we see, following interaction with my friend, Hal Macomber. Hal makes this point on waste, muda. You can't eliminate waste that you don't see. We practice teaching about waste thinking that will be enough. We need to shift the concerns people have about waste. Waste is evil. Waste kills companies. Waste depletes the planet. Overstatement? Perhaps. I don't think it's overstatement at all, Hal. I ask myself: Has my view of waste gone "soft"? Do I regard it as an evil to be eradicated with the same vengeance an oncologist going after the cancer in his patient? Do I see waste with passion or academic intrigue? I spoke with some colleagues recently about an increase in work-in-process inventory in a supplier's facility with which we were each familiar. Did they care? Did they grasp it's negative impact on product quality and delivery time? Or, as we feared, was it a short-term, knee-jerk reaction to management pressure? Such that the production team in charge didn't even see it?? Each of the Seven Wastes can kill us. Nothing less. Can I see them?? Do I even choose to look for them? In a recent post, I broached the topic of how our attention causes us to notice certain things. My friend of many years, Hal Macomber, responded with further insight into the topic, one he has considered for a long time. This depth is worth noting and I'll do this in the next few days. The effect is governed by the reticular activating system, an ancient part of our brain that keeps us safe. The fundamental trigger of the system is the commitments we live. For instance, a parent's naturally acquired commitment is to the safety of her child. Parents are walking-around always-seeking hazard-finding machines....and without consciousness for that. Making commitments, setting goals, getting clear about our own and others' concerns is the way to direct our noticing. Yet so many people don't have specific enough goals or commitments that they produce the shift. Rather, many people notice little that could help them. The parent is wired to notice things which will harm or help her child. So, she notices them. This comes naturally, for most. Yet are the other goals we have in business or life that clear? Do I have a personal mission statement which helps me choose which activity to pursue and which to ignore? Do I know what are the key steps for my business to succeed? Have I written them down so I will recognize opportunities more clearly? Put simply, to what am I committed? If I don't know, I won't notice much. Does the knowledge worker do things in a Lean way by simply having a clean desktop? Is it merely a matter of clearly alphabetizing her book shelf? That's perhaps necessary but far from sufficient. So much more revolves around the knowledge worker treating the flow of information the way an assembly worker treats the flow of physical material. Do I turn the raw data into a readable report, promptly? Do I take my education on writing C++ code and make it flow into quality software? Do I take the income statement and cash flow statement and make a prompt decision on that purchase request? This topic increasingly grabs me. It really shouldn't be that difficult to unsubscribe from an email list I'm no longer interested in. So why does the stock message say "We'll comply with your request in the next ten days"? Back in the days with preprinted mailing labels, I could see where the delay would be. But now?? With sophisicated, cheap and fast databases?? It strikes me as rude. And certainly not an excellent process. Maybe they want to keep bugging me with email, despite my request?? It is simply an example of a lousy process. Waste of attention. In our digital culture, waiting 10 days is no longer acceptable. The marketplace has changed. The process has to change with it. Some of you receive this blog via email. There's an "unsubscribe" link at the very bottom of this email. If these thoughts don't add value for you, feel free to unsubscribe! And I'm pretty sure it will happen immediately! And, one way or another, keep learning. Consider the ubiquitous office email, sent to "all". Everyone in the company or department gets the notice, which may only relate to some. This broadcast method distracts attention and, thus, injects waste. Even worse is the follow up email which is not really following up. A Team Leader sends a note to ten team members requesting a response in a week's time. During the week, four of the ten team members responds. A week later, the Team Leader sends out a second email to the Team, saying "Please answer my question." He does it because he has made a "Group" for the team. So, even the four people who DID respond are bothered again, perhaps wondering if they did actually respond to the original request. Far better to only send the note to the six slackers and make each email carry real meaning. "depends a great deal on whether or not people using these tools are willing to make real predictions and then evaluate them against the actual outcomes, as opposed to simply looking for interesting patterns after the fact and reporting on the ones that look good." Sounds a lot like a good Plan-Do-Check-Act cycle, to me. The PDCA cycle is always worthwhile. But to work really well, it needs to be honest, as quoted above. It requires a stated, written expectation ahead of time and an honest, reflective review after the fact. It can't "pick and choose" the facts it wants to support. In my experience, it is the reluctance to reflect on results and how they compare with the plan that is the weak link for many PDCA efforts. Once done with a project or a fiscal year, the weary warriors just want to get on with something new. Unfortunately, when we do this, we are often doomed to repeat the same errors that made us miss the mark in the first place. Reflection and honesty are the best antidote. But we often don't want to take that medicine. Steve Spear's excellent book, Chasing the Rabbit is the best description of PDCA out there, with a myriad of examples from multiple industries. I commend it highly to you. It's in the top 5 books about Lean out there. "Sure, you can bring it back" said the customer service rep, with a friendly voice. Which door at your store should I come to, I asked. "Oh, just the one in the back," she replied, casually. I knew from a previous visit there were six "doors in the back." It was a large store. Is there a number on the door you want me to take it to? I asked again. "It's kind of near the north-east corner," she told me after some thought. Why do we label things? Why do we put numbers or names on exterior doors? Why do we put name tags next to cubicles? Why do we put shelf labels in the warehouse? Why do we make legible labels for file folders? A lack of clarity is a breeding ground for errors. Clear labels are a good start towards deeper clarity. Some days, the Lean Leader has to be fully strategic. Big picture stuff. "Here's why we use pull and not a scheduled build." "This is why we make these labels so clearly." It's qualitative. Perhaps cerebral. Almost always the verbal/written formulation of ideas. Other days, the Lean Leader has to be fully tactical. Detail stuff. "I crunched these numbers and here's what I learned." "We can't take 4 minutes of labor time here, it misses our target cost." It's quantitative. Perhaps boring. Almost always with calculations and conclusions. You often don't get to chose which day it's going to be, either. So, smile when you wake up...it's one or the other. Confronted with a soul-suckingly deep pile of email in my in-box yesterday, I felt some level of despair. I had to get through it but found the prospect extremenly discouraging. When I recalled a trick I had read some years ago. Rather than looking at the inbox with its default listing of most recent email first, resort the pile. Sort it alphabetically by Subject. Sort it by sender. Reverse sort it by sender. Anything. Make the pile look different. So I did. And I quickly whittled the pile of 50+ emails down to the 10 that truly needed attention. And then I wondered: "Why is such a dumb little trick so effective? I didn't alter the pile...I just rearranged it. Why did is cease to be a despair-inducing exercise?" I think it is just the new sequence. Busting out of the chronological sequence into some other sequence, even one that doesn't make much sense. It makes the inconsequential emails about available free kittens seem even more silly and more easily deleted. Which is also why it's good to look at any process backwards, rather than forwards. You see new things. And silly things which are so very deletable. Is there a more efficient system out there right now than Craigslist?? Every time I interact with it, I'm in awe. It is spare...no bells and whistles, so it runs fast and runs simply. There are strategic and practical examples for us here. It is worth reflection. The writer was Peggy Noonan in this opinion piece in the Wall Street Journal. She writes of Mitt Romney. But my point is not political. These same words could be said of any of us offering leadership in our companies. Do those who work with us know our "insides"? Do they know what overarching framework will shape our actions? Do they fear us being "herky-jerky"? This is why a deep understanding of Lean as a strategy is crucial. Why having that framework is essential for the motivation and engagement of those with whom we work. Why letting people see our "insides" is not a sign of weakness but a sign of strength. Picked up a new question today. One word. And I've been thinking about it. Stated calmly and without an edgy tone, it invites the speaker to contine. To amplify. To add some further information. It does not commit the speaker to agree or disagree. But it does engage. It does state a willingness to listen further. If I'm truly interested in listening, it will often result in more depth. Yeah, I think so. I'm trying it. We know our job as Lean leaders is to eliminate waste. We also know we can’t eliminate waste unless we first see it. What we focus on changes what we notice. Our brain filters information, seeing one thing in a situation instead of something else, based on what we identify with, what we have our attention on, what we're looking for—more or less consciously. In one meeting optometrists notice who's wearing eyeglasses, affirmative action advocates notice the ratio of minorities in the group, and interior designers notice the color schemes. Unapologetically, the Lean leader sets out to see waste. And when she does, she sees it. Do I try to predict what demand will be for my product? Do I try to respond to demand which is evident? Do I try to train my people for what I think they will need? Do I try to help them be rapid learners of the skills required? Do I try to guess what new products will sell well? Do I make a lot of products and make more of what sells well? Do I try to anticipate which direction the stock market will move? Do I set up my portfolio to respond reasonably whatever the market does? You can learn a lot from a trash can. It is the one place everyone agrees is the placeholder for waste. This morning, I pulled a large sheet of purchased material from a trash can. We had punched a number of smaller parts from it. There was a perfect stencil remaining, the outline of all the punched parts. And, man, was there a lot of material left. A quick set of measurements confirmed what my eye suggested…by moving the cutting pattern around, we could have had almost 20% more parts from this same sheet of material. We designed in waste to this automated cutting pattern. We have no one to blame but ourselves. We planned the waste and executed the design perfectly. Is there anything more painful than seeing such intentional waste? You can learn a lot from a trash can. My colleague noticed a nearby piece of equipment six inches off of its appointed place. Now, not all six-inch displacements are critical but this one was and he knew why. This displacement bore the risk of causing a significant quality problem. He knew it and it allowed a discussion with the supervisor, at that point, at that time, about the criticality of the correct equipment placement, what to do about it and how to prevent it. There is no way any report, paper or electronic, would have ever shown this potential problem. There is no way any conference room would allow the timely, clear discussion he had with the supervisor. There is no way any management seminar could ever communicate to a supervisor the passion for getting this part of the process right. We had to go to the workplace.